Light rain around dawn, later cloudy and light NE breeze. Close to perfect trapping conditions, if only there had been any birds around...... Nets open 06-15, netmeter hours = 2800. Ringed: Meadow Pipit 2, European Robin 5, Song Thrush 1, Ring Ouzel 1 (first this season), Blackcap 3, Chaffinch 1, Common Linnet 2, Mealy Redpoll 1 (first this season). Total = 16. 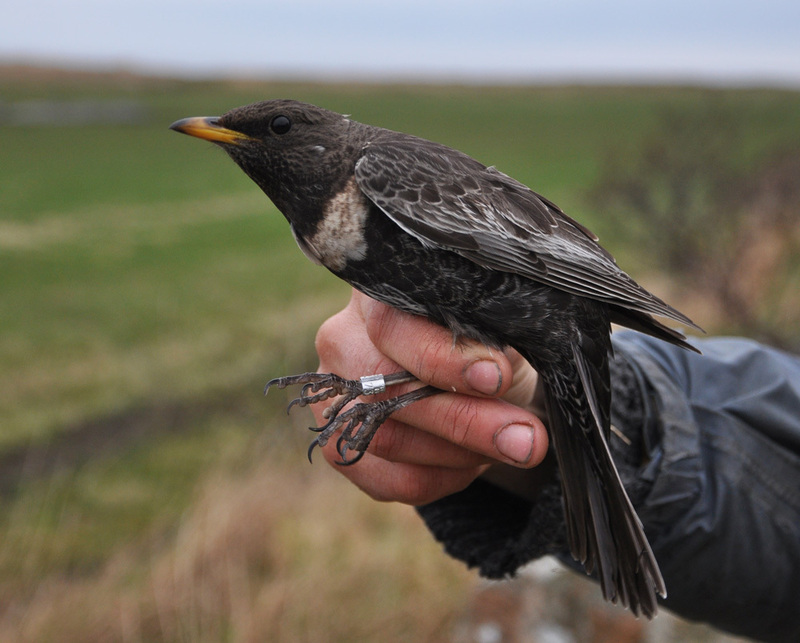 Although numbers are quite low (but normal for this time) there are some nice birds in between, Ring Ouzel is a good catch and less than annual in the ringing total. 3 blackcaps was also a surprise at this early date. Ringmerket: Heipiplerke 2, rødstrupe 5, måltrost 1, ringtrost 1, munk 3, bokfink 1, tornirisk 2, gråsisik 1. Total = 16. Ring Ouzel. 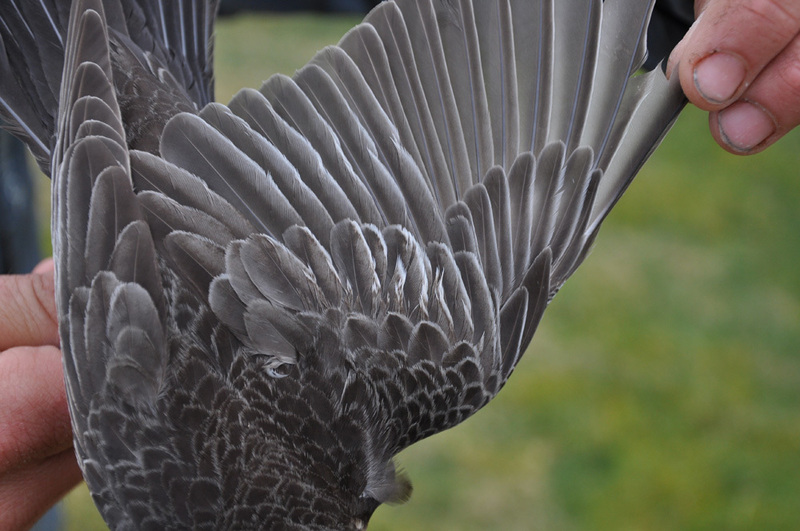 Adult female (all greater coverts of adult type). Ringtrost, 3K+ hunn. Alle stordekkerne av adult type. Observations: Whimbrel 1, Northern Wheatear 3 (BO/Reve kai), Pied Wagtail 1 (Reve kai, the BTO-ringed bird), Dunnock 1-2, Twite 4. There was quite a lot of disturbance to the trapping area today. There was a work crew from our broadband supplier operating compressors to install a fiber cable, and work continued on the new ponds. Two nets by the large pond were replaced. For the first time this year there was a decent catch in the Robinson-traps, two traps produced 50 moths (7 species ). 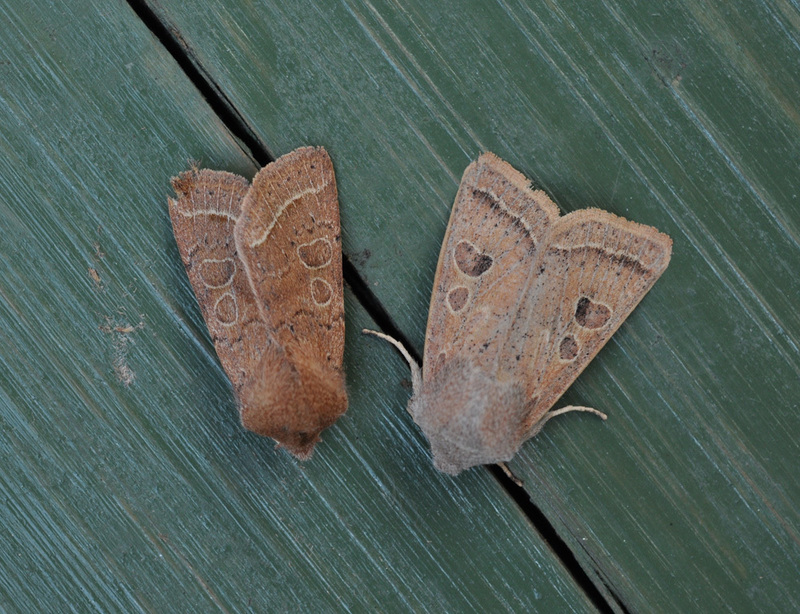 Common Quaker (Orthosia cerasi, left) and Powdered Quaker (Orthosia gracilis). The latter is a Revtangen speciality. Tverrlinjet seljefly (venstre) og punktseljefly. Haavard Husebö and Alf Tore Mjös.